Editors Note This is a critical time for Arab States. Many have become very wealthy due to oil income while prices were high and the impact of the OPEC oil cartel. This is changing with lower oil prices, the reaction to climate change, the growth of renewable resources such as solar power, the discovery of new resources, for example oil by Israel and shale oil by the USA. The effect is their review by of how they use their resources, their need for skilled labour and internal use of their resources instead of giving them away. 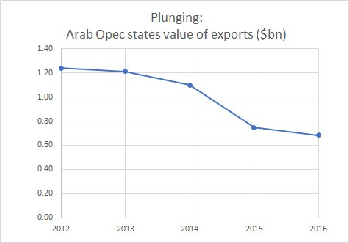 The urgent need for Arab oil producers to introduce economic reforms that lead to financial savings and new jobs is clearly shown in Opec's 2017 Annual Statistical Bulletin. Between 2012 and 2016 the populations of the seven states (Algeria, Iraq, Kuwait, Libya, Qatar, Saudi Arabia and the United Arab Emirates) grew by 10% (see table). Yet the ability of these states to cope with the continuing rise in the number of inhabitants has declined because over the same period revenue from exports fell by 45% (see graph). The biggest population increase—a rise of 3.676m—was in Iraq, where the public purse is already being hit by low oil prices, expenditure on the war against Islamic State (IS) and the need to provide for thousands of homeless people. Algeria, which is struggling to attract new investors in the oil and gas sectors, was close behind with a 3.305m rise. The population of Saudi Arabia grew by nearly 3m between 2012 and 2016—when the kingdom's Vision 2030 was unveiled. This programme aims to lessen Saudi Arabia's dependence on oil revenue and to create thousands of new jobs. Given the high demographic growth rate, finding employment for young Saudis in the years ahead presents an enormous challenge. For all the seven states, the task of coping with more and more people arriving on the jobs market is being made difficult by the calamitous drop in export revenues. The collapse of global oil prices, which began in 2014, led to a serious drop in earnings during the subsequent two years. Algeria, which took in $77.12bn in export revenues in 2012 saw the figure plunge to $29.05bn last year. Iraq's earnings also more than halved, tumbling to $43.89bn, while Kuwait's revenue—which was $114.52bn in 2012—had shrunk to just $46.26bn only four years later. The loss of its 230,000 barrels a day half-share of Neutral Zone production since 2015—because of a dispute with Saudi Arabia—hasn't helped. Even Saudi Arabia's export revenue has plunged. In 2016 the kingdom's exports were worth $179.58bn, down from $388.4bn just four years earlier. The UAE fared better; its 2016 figure of $298.65bn was down only $61.08bn on the 2012 level. With no sign of either a significant revival in oil prices or a slowing in population growth rates, the need for economic reform is ever more pressing. For some Arab states, it's becoming a matter of fending off social unrest. For others, it's a matter of survival. Iraq and Saudi Arabia are negotiating a new alliance that would give Riyadh a leading role in rebuilding Iraq’s war-torn towns and cities, while bolstering Baghdad’s credentials across the region. Meetings between senior officials on both sides over the past six months have focused on shepherding Iraq away from its powerful neighbour and Saudi Arabia’s long-time rival, Iran, whose influence over Iraqi affairs has grown sharply since the 2003 ousting of Saddam Hussein. Iraq and Saudi Arabia have long been considered opponents in the region, but a visit by the Iraqi Shia cleric Muqtada al-Sadr to Riyadh last week and a follow-up trip to the UAE further thawed relations which had already been much improved by high-profile visits between the two countries. The arrival in the Saudi capital of Sadr – a protagonist in the sectarian war that ravaged Iraq from 2004-08 and who has enduring ties to Iran – highlights a new level of engagement which could see Riyadh play a significant role in the reconstruction of the predominantly Sunni cities of Mosul, Fallujah, Ramadi and Tikrit. Sunni areas of Iraq have borne the brunt of the three-year US-led war against Islamic State, which has been largely successful. Isis no longer controls any city; it is confined to a series of towns in the north-west and throughout Anbar province. But it is thought it will cost more than $100bn (£78bn) to rebuild Iraq, and the four Sunni cities, as well as three mainly Sunni provinces, are central to hopes of national reconciliation in a country where more than two-thirds of the population are Shia. As Iraq moves towards national elections early next year, the prime minister, Haider al-Abadi, and Sadr have both said the re-enfranchisement of Sunnis – who lost privileges and status after the fall of Saddam – must be central to rebuilding plans. In Baghdad, where attitudes towards Saudi Arabia have been openly hostile throughout the war on Isis, rhetoric blaming Riyadh for the jihadist insurgency has softened recently. Baghdad and Riyadh had not exchanged ambassadors for 25 years until the ill-fated return of a Saudi envoy in 2015, which prompted a vitriolic series of allegations about responsibility for Iraq’s insurgency and the broader regional chaos. But over the past year, Abadi and the Iraqi president, Fuad Masum, have visited Riyadh, and the Saudi foreign minister has travelled to Baghdad. “This is a new beginning, a new page of Iraqi Saudi relations,” said Ihsan Al Shameri, the head of the Political Thought Centre in Baghdad. “It was troubled and on edge in the past, especially during [the former prime minister] al-Maliki’s rule. Now that the Saudis have found a non-sectarian political figure in Haider al-Abadi, they are willing to work together. They are no longer focused on a Shia-Sunni rift. Moreover, Iraq wants to ‘return to the Arab fold’ and the window to the Arab world is Saudi Arabia. Senior officials in Riyadh, which has set itself an ambitious economic and cultural reform agenda, see opportunity in rebuilding the Sunni areas of Iraq as part of broader moves to curb Iran and assert the kingdom as a post-Isis force. “The situation in Iraq matters to the entire region, in security, economic and political terms,” said Jabri. “It is therefore natural for the Saudi leadership to seek foreign policy avenues to support Iraq at this critical moment. This visit is a clear step in that direction. Muqtada al-Sadr is a respected leader with significant influence. He understands that Iraq’s future lies within the Arab world, and has repeatedly expressed concern about Iran’s growing influence in Iraq. Not a single country is capable of restoring Syria, a country devastated by a nearly six-year-long war, on its own, Abdullah al-Dardari, the Deputy Executive Secretary of the UN Economic and Social Commission for Western Asia and former Deputy Prime Minister of Syria, told Gazeta.ru, adding that it should be a multilateral effort. Russian President Vladimir Putin "is correct in saying that reconstruction and financing of the Middle East should be a priority for the international community. Moreover, we need shared responsibility since not a single country, including the United States, the European Union, Saudi Arabia, Iran and China, is capable of restoring the region on its own. They will not be able to rebuild even Syria, which is estimated to have sustained damage amounting to $350 billion," he said. In late October, Putin suggested that the international community should work out a long-term comprehensive program to restore Middle Eastern nations shattered by domestic and foreign-led conflicts. He compared it to the Marshall Plan, an economic assistance initiative which was meant to rebuild Europe following World War II, due to the "mammoth scale of destruction" in the Middle East. The UN official also explained why economic considerations should be taken into account during the peace process and not afterwards. "Parties to the conflict must understand that a military or a political victory in the Syrian conflict will not be enough. If there is a single winner in Syria, he will have to pay for all. He will bear the burden of economic responsibility for [the country's revival]," he noted. "This is why it has to be a comprehensive process which will unite all of the stakeholders." Dardari further said that both Russia and the United States could benefit from taking part in this process. "Setting the Syrian economy back on track with the support of Russia and the US is not a zero-sum game. These are not mutually exclusive processes. I think that there are enough resources and space in Syria to satisfy economic interests of the US, Russia, regional stakeholders and most importantly the Syrian people." Dardari also said that no one has a clear understanding of the scale of the damage in Syria. As a result, the international community is in the dark about the key challenges on the path to rebuilding the Arab nation. Western powers are reluctant to help rebuild Syria after its civil war, because they think the wrong side won. Russia and Iran played a major part in that outcome — but they can't afford a bill estimated at a quarter-trillion dollars. Qin Yong, vice-president of the China-Arab Exchange Association, said he he sees burgeoning interest among Chinese companies. "We get phone queries every day," he said. "They see huge business potential there, because the entire country needs to be rebuilt." The enthusiasm is reciprocated on the Syrian side, says Qin. "They're like, don't come tomorrow, come tonight!" As the 6 1/2-year war winds down, with BasharAssad still in power, the battle for influence in Syria has shifted to the diplomatic arena. Reconstruction, which the United Nations says could cost $250 billion, is a key part of it. Russian President Vladimir Putin has declared victory in his two-year military operation to shore up Assad, and is now appealing for international funds. At his annual press conference on Dec. 14, Putin showed signs of frustration. He said Syria, whose conflict sparked the worst refugee crisis in Europe since World War II, will remain a breeding-ground for extremist groups such as Islamic State without improved living standards. "All people of goodwill around the world should understand that if we do not resolve this together, it will be their problem as well," he said. The U.S. and its European and Gulf Arab allies, which backed the Syrian rebels, say that problem is largely of Putin and Assad's making. They've eased up on calls for the Syrian leader's immediate departure, but continue to insist that he can't stabilize the country and has no long-term future. Withholding money for reconstruction is one of the few cards they have left. Unlike Iraq, which was pumping out about 2 million barrels of oil a day even in the traumatic years right after the 2003 U.S. invasion, Syria has little ability to generate cash internally to pay for its own rebuilding. Diplomats in Moscow say that Russia has repeatedly pressed European Union governments to help foot the bill. At the same time, Russia has rebuffed calls for Assad to step down eventually, and his government has shown few signs of willingness to share power. The EU, Arab nations and the U.S. put aside $9.7 billion in April for humanitarian aid and rebuilding Syria. But in September U.K. Foreign Secretary Boris Johnson said the anti-Assad coalition won't support reconstruction without a political transition. In the U.S., lawmakers from both parties this week introduced legislation they dubbed the "No Assistance for Assad Act," seeking to channel any American aid to the parts of Syria still outside government control. U.S.-backed Kurdish fighters hold much of the country's northeast. "Things have hit a dead end," said Alexander Shumilin, head of the Center for the Analysis of Middle East Conflicts in Moscow. "Russia's military victory in Syria hasn't brought a political settlement any closer." That's keeping European companies away. German business, for example, has "the know-how, the products and the motivation to reconstruct Syrian infrastructure and industry,'' said Philipp Andree, director for the Middle East and North Africa at the Association of German Chambers of Commerce and Industry. It can't happen without "an internationally recognized peace agreement," he said. Steelmaker Thyssenkrupp will only "re-enter the market" once Syria stabilizes, spokesman Tim Proll-Gerwe said. Turkey, whose construction industry is active throughout the region, has been angling for business. "Turkey and Saudi Arabia will be the reconstructors of Syria," the chairman of the Council of Saudi Chambers of Commerce, Abdulrahman Abdullah Al Zamil, told Turkish newspaper Sabah in February. But both countries supported the opposition in Syria. Assad insists such nations won't get a role in reconstruction, even if they want one. Abd al-Kader Azouz, a consultant to Assad's government, says money can be found from wealthy Syrians, the BRICS group of emerging economies, and multilateral lenders not controlled by the West. A few deals have been reached. Last year, Syria said it had agreed on 850 million euros of contracts for Russia to rebuild infrastructure. Iran signed accords worth "several hundred million euros" to repair power grids, Press TV reported in September. Russia says it's been promised further contracts to rebuild Syria's energy facilities. Western involvement isn't essential, Putin's top envoy to Syria, Alexander Lavrentiev, said in an interview in Ankara: "There are Russia, Iran, China, India and many other countries." Still, he acknowledged that Syria's post-war financial needs are "colossal." China, an increasingly close Russian ally, won't meet them all. Qin's association estimates there could be about $2 billion of investment at this stage. Qin says the companies he's been escorting to Damascus, Homs and Tartus — including China National Heavy Duty Truck Company, whose Hong Kong-listed arm is Sinotruk -- are eyeing projects to build roads, bridges, airports and hospitals and restore electricity and communications. That may just be the beginning, because Syria fits into Chinese strategy. The country was a key link on the ancient Silk Road — and President Xi Jinping's most ambitious plan involves building a new one: the multi-billion-dollar Belt and Road Initiative, which aims to weave a Chinese web of trade and transportation links across Eurasia and Africa. Foreign Minister Wang Yi, who met his Syrian counterpart Walid Muallem in New York in September, said that will be "an important opportunity for bilateral cooperation in future." For all those grand visions, there's an immediate obstacle for Chinese business in Syria, according to Qin: Settlements in dollars and euros are banned, because of U.S. and EU sanctions aimed at cutting Assad's regime off from the world economy. That's one indicator that, without a compromise on Assad's future, Syria is likely to remain partially destroyed for years to come. Robert Ford, who was U.S. ambassador to Damascus during the early years of the war and is now a senior fellow at the Middle East Institute in Washington and a Yale professor, says the deals mooted so far are a drop in the ocean. "We're talking about hundreds of millions of dollars," Ford said. "Syria needs billions. It's going to fall well short of what's needed to rebuild the country — which means that the country won't be rebuilt very quickly." WHO WILL FUND THE DREAM OF REBUILDING SYRIA BACK TO ITS FORMER GLORY? Lebanese banks are the only institutions who know how to open enough letters of credit to fund Syria’s reconstruction materials: so rebuilding Syria means big profits for them. It might seem obscene, even grotesque. But the businessmen, construction giants and entrepreneurs of Lebanon are already planning the rebuilding of a physically shattered and broken nation called Syria. With at least 280,000 dead – the statistics become more wobbly the longer the civil war continues – what’s the point of talking about the nation’s restoration, you may ask? Well, who could be more expert than the men and women who have restored – not very successfully, it must be said – the glories of their own capital of Beirut after Lebanon’s 15-year civil war? Brave words from Nicholas Nahas, you may say, but his impatient colleagues expressed much the same optimism at a conference of businessmen in Beirut. The Lebanese are well known as the 10 per cent men of the Middle East and don’t want to be left out of the reconstruction profits once the war is over – whoever is then in charge of Syria. There are plans for a massive increase in the capacity of Beirut port and of the small harbour in the city of Tripoli and the reopening of the overgrown airport at Qlaiyat in the far north of Lebanon. Lebanese banks – and there are seven private Lebanese banks in Syria today – are the only institutions who know how to open enough letters of credit to fund Syria’s reconstruction materials: so rebuilding Syria means big profits for them. There’s even a steam train enthusiast in Beirut who has for more than two years been proposing a four-track electric railway from Beirut port which would speed trains through a vast tunnel in the Lebanese mountains to a marshalling yard in the Bekaa Valley – poor Baalbek, I keep thinking! – from where steel and concrete would be trucked over the anti-Lebanon range to Damascus, Homs and even Hama. Nabil Sukkar, a development and investment analyst who was a close economic confidante of Hafez al-Assad – father of Bashar – turned up in Beirut to tell Lebanese and UN delegates that priority must be given to the reconstruction of the great Syrian motorways from Aleppo to Damascus and other cities as well as the Syrian harbours of Latakia and Tartous. But how to blend dreams with reality? Millions of Syrians have fled the war and their children – those in Arab countries, at least – are growing up with poor or non-existent education, despite local and EU assistance. How can legions of young Syrians reconstruct their country if they cannot read or write? True, the ancient centre of Damascus has been largely spared destruction but the old city of Aleppo and its wonderful mosque – and the Ottoman heart of Homs – has been reduced to rubble. Who will reconstruct the masterpieces of Syrian architecture? Lebanese architects tried to inspire a recreated but re-imagined Beirut after their own war. They restored the French mandate streets of the 1930s but allowed the bulldozers into the Ottoman ruins. Instead of the popular soukhs that once adorned old Beirut, the new streets are packed with Parisian and Italian fashion houses whose prices only the wealthy can afford. Yet, as economist Marwan Iskandar points out, Lebanon’s expertise in schooling and hospitals on an international level should help Syria restore its education and health infrastructure. So do the Syrians and their Lebanese assistants start with the restoration of the beauty that was destroyed – or by reconstructing the huge suburbs whose original slums housed thousands of those whose oppression and poverty inspired the 2011 revolution? There are cynics who claim, rightly, I fear, that much of the destruction has been caused to buildings, which were themselves a scandal of construction. So why not force the thousands of secret policemen to abandon their dungeons and do a proper job of rebuilding their country with their hands? At the very least, Syria’s poor must be given homes of which they can be proud. This is an opportunity as well as a burden. But post-World War Two experience does not, despite the Marshall Plan, hold out much immediate hope. I remember the rusting, corrugated iron nissen huts that surrounded my own home town of Maidstone for years after the war, all that bankrupt Britain could afford families in the decades of austerity. Despite the reconstruction of old Warsaw, the Polish capital and the fire-bombed German city of Dresden were later packed with grey concrete slab apartment blocks which were a disgrace for generations. Syria must not suffer that fate – a recreation of the pre-civil war housing which would only reproduce the same pre-war bitterness. By chance, Thomas Piketty, France’s brilliant cover-boy economist, has also just been in Beirut, explaining how the Middle East is the most economically inequitable place in the world. Only 10 per cent of its 280 million people benefit from 60 per cent of its revenues, and Isis – the enemy of the world as well as Assad – “feeds on the frustration” of this inequality. The system favoured by Saudi Arabia and Qatar, where supplicants come “to seek crumbs from the table”, does not work. Piketty favours an Arab Union based on the EU model – some hope. But of course, the big problems remain. Who will fund the rebuilding of Syria? The Gulf States will surely refuse if Bashar remains. But Russia, China and Iran will assuredly want to put up the cash if he stays. Then it would be the Syrian émigré opposition which would be cut off from the country’s reconstruction. And the US, of course. Or would a victorious Syrian army become the arbiter and guarantee of Syria’s economic future, whoever is the nation’s official leader? For as we all know, the world loves the military. Just look at the money we – I’m including Russia -- have poured over the years into the armies of Egypt, the Gulf, Jordan, Libya, Iraq, Lebanon, Syria and, of course, Israel. The Syrian army rebuilds the Syrian nation. A regime tautology, a cliché. But I can already imagine it on the billboards. Major infrastructure of Yemen stands destroyed in the war. People are forced to live in growing misery without basic necessities of life. They are looking to the international community, especially the Muslim, for support. I am writing this to draw the attention of Muslim world including, my government, to help the suffering Muslim brothers and sisters in Yemen. The Yemanis started suffering when the war broke out in 2015 when rebels tried to put immense pressure on the country’s government. As a result two forces emerged — loyalists of President Abdrabuh Mansour Hadi and the allies of Houthi rebel movement. The initial civil crisis shortly gained international importance when ISIS and Al-Qaeda entered the arena to control some of the Yemen’s territory. Yemen, listed as the poorest Arab country, has a population of 26 million out of which, 21 million have suffered deeply from this war. Some 80% of them have even lost access to clean water. The country is facing worst food crisis where 7 million are only a step away from famine. Cholera outbreak has worsened the health crisis with over than 200,000 cases and 3,652 vaccination facilities going non-operational in early 2016. As a result 2.6 million children under the age of 15 were exposed to preventable diseases. Damage to the infrastructure and economy is immeasurable. Over 2.5 million people have been internally displaced leaving behind ashes of their homes and personal belongings. In 2016; according to reports, Yemen economy has suffered estimated $7.3 Billion loss. Houses, hospitals, schools, markets and even the trade and sanitary systems have been completely destroyed in many cities. The hospitals and schools, undamaged or not destroyed, are now either used as shelter by the refugees, or are occupied by the fighting rebel and armed groups. Reports show, that total number of 63 health facilities were attacked; out of which, 3 were used by the armed groups. Furthermore, 51 attacks are confirmed to be specifically targeting the educational facilities including schools and personals. Out of 1600 schools, 280 were completely destroyed, and 500 were used as shelter homes. Rebels managed to occupy 33 schools, using them as barricades. Schools suffered damage with $250 million calculated cost. A post-conflict economy like Yemen’s is in no way comparable to a regular economy facing a crisis. The rebuilding of the socio-economic framework of a war-torn society is the first priority. However, countries facing war, or fighting a violent conflict from within, face tremendous and hard to achieve challenges while returning to normalcy. The humanitarian relief involving food, water, shelter and protection to the victims is the first step to recovery followed by the financial relief to rebuild the drastically damaged economy. War has broken up social and economic networks, destroyed assets of the state, inflicting deep wounds on the people of Yemen. The country will take a long time to return to normalcy. The cities of Sa’ad in the north and Aden and Taiz in the south are left in ruins by the catastrophic nature of the war. The reconstruction cost for energy facilities in just four cities was estimated to be $139 million. One can’t even imagine the cost Yemen has to bear to rebuild its overall infrastructure and to initiate and complete the rehabilitation process. How could a country hit so hard by an internal and external feud and power crisis, can be rebuilt and rehabilitated without support of allies? International aid is indeed the speediest long-term solution to the crisis. The destruction and damage done to the country has to be categorized through systematic clearance and rehabilitation process for specified selected areas, one by one. The process for reconstruction and rehabilitation needs time and skills. Here a trust deficit created as a result of the war in the hearts of Yemenis for the western powers is a limitation; therefore the building and restoration should not be done by western companies as the Yemenis will still look at it with suspicion. However; if this rebuilding is done by Pakistan then being a Muslim country, the help is not likely to be opposed. The expertise of the Pak army in crisis management and their skills in rebuilding and rehabilitation of the war ridden areas are unmatchable. The restructuring of infrastructure and the well planned rehabilitation processes both in Swat and Fata undertaken by Pakistan Army, were exemplary. The northern Yemen Tyrian is very much similar to that of FATA, and there is no doubt in my mind that the Pak army is the best institution to carry out rehabilitation operations in Yemen in the most effective way. I further would like to propose that Saudi decision-makers consider inviting Pakistan for the rebuilding process in Yemen so that as a neighbour Saudi authorities can play their effective role in providing relief to Yemen by effective logistic support of Pakistan. In the meantime I would like to advise our defence team to not waste opportunity of helping Yemen with the coalition of other allies like Saudi Arabia; not only with the intention to support a Muslim nation in need, but also to create a long-term ally and friend in the global political dynamics. This reconstruction of infrastructure and rehabilitation in Yemen should be considered to be undertaken by FWO, NLC and by prominent Pakistani private builders. It would be wiser to encourage participation of retired army officials from the corps of engineers and labour force from private companies to work together in Yemen. I also propose that the initial survey and research, construction and rehabilitation must be done under the supervision of OIC teams to avoid any complications. This way Pakistan could offer their expertise, skills and a gesture of peace, human love and respect to Yemeni brothers and sisters, which indeed will be acknowledged by the international community. The reason I urge Muslim nations to jointly help Yemen is because of my study on the destruction in Iraq where owing to the increasing number of deaths, and hopelessness, the people there became vulnerable and were left at the mercy of Daesh. I feel that if Pakistan plays an effective role in the rehabilitation process of Yemen with SaudiArabia and other Muslim countries, it could be saved from becoming another Iraq, helping Yameni families return to their homes and life. Pakistan should also take the initiative through the ministries of foreign affairs and defence to negotiate with the stake holders concerned to undertake the rehabilitation project in Yemen as soon as possible. It will send a positive message to the Muslim world, and I hope it can generate a positive response as well. I am hopeful that this proposal will be viewed positively and would be acceptable to HM King Salman bin Abdul Aziz and the vibrant Saudi crown prince Mohammad bin Salman. back to its former glory? HOW WILL YOU REBUILD IRAQ? OVERVIEW OF THE PROBLEMS FACING THE IRAQI PEOPLE. HOW WILL WE REBUILD SYRIA? According to Abdallah Al Dardari , Senior Advisor for reconstruction and rehabilitation in MENA, World Bank Group, the international community does not have other choice, than to start planning for the rebuilding of Syria and the Middle East. A lot of things can be done just now. The challenges will be tremendous: there is big loss of capitals, loss of human resources. The value of destroyed capital stock is around 100 billion dollars in physical assets, 1 trillion in human development. Even when the war is still going on, a lot of preparation and planning have to take place. The first step is to understand the exact damage, and to separate the damage from the short, medium and long term needs. The problem is who will manage the reconstruction. Russia plays the central political and security role today. It can facilitate the international cooperation in rebuilding of Syria. It can not be done only by one country. The international cooperation is needed.